In our initial plan (a) route, we previously decided to miss the Bungle Bungles (Purnululu National Park) altogether and do the Gibb River Road all the way through to Derby on the west coast from Kununurra in the east. However, plan (a) was somewhat thrown out as we piked out at the last minute on doing all the Gibb from the heat effect (yes, we’re all soft) and headed for Broome in a new plan (b) route via Halls Creek and Fitzroy Crossing …but not before a brief two night stop over at Mabel Downs to see the Bungle Bungles. 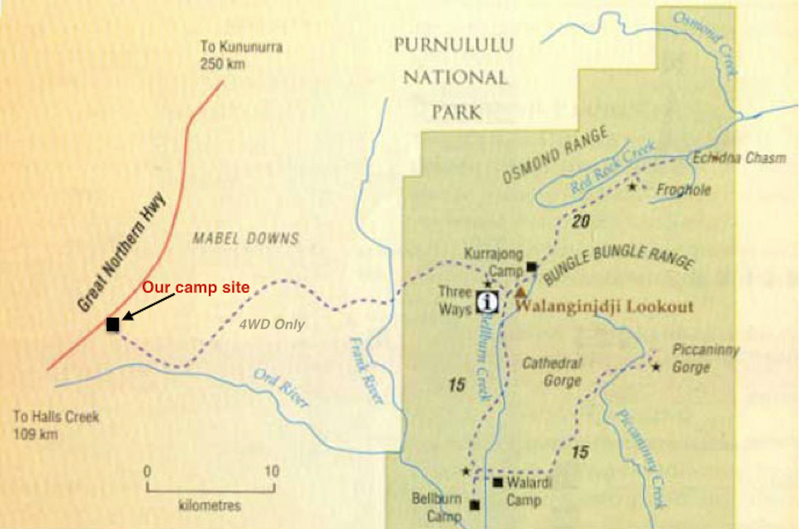 Mud map of Bungles, 4WD road in and our camp site position. 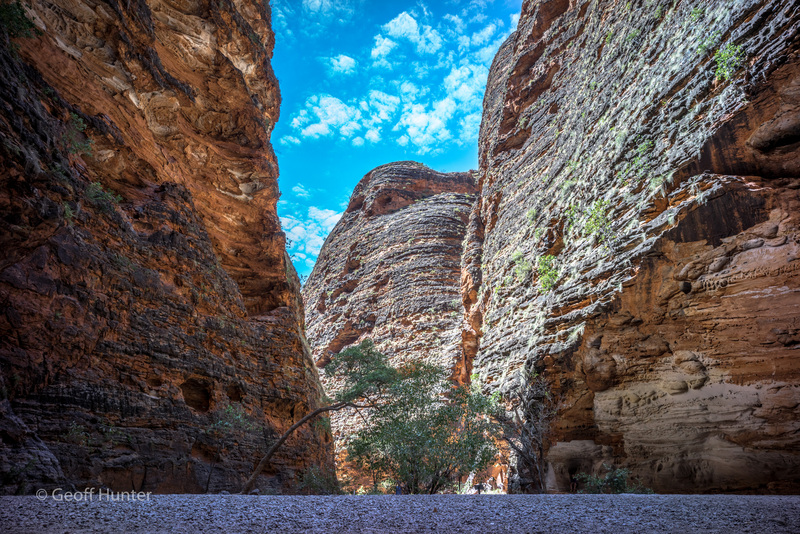 Even though the Bungles are a UNESCO world heritage site and the scenery is spectacular in its own right, the only road in and out (which is a 4WD-only gazetted road) does not allow dual axle caravans into the Bungles national park. We also had read and heard from some other recent travellers of past “horror stories” of how rough the road into the park and how numerous brokendown 4×4’s and Caravans were often strewn along the side of the track like some sort of scattered travellers’ vehicles graveyard. We thought hard and long; do we need to put ourselves through this and if so, is access really as difficult as we were led to believe? 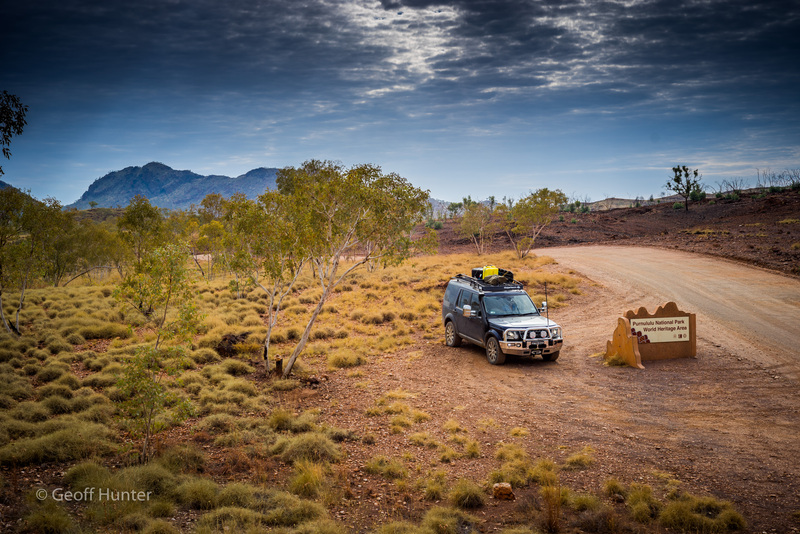 We decided to go for it late on the last night at El Questro Station and off we went early the next day. We found ourselves looking for a nondescript park entrance for large vans on a well corrugated and dusty road just off the northern Hwy 3 hours south of El Q. We were looking for a recently new caravan park 1.5Kms in from the highway on the Mabel Downs Station road and could be closed for the rest of the season however we may still be able to stay there so long as we did not need power or water. We found the park after coming through a series of shut gates just after lunch. No one else was there but us, a few wallabies, a diesel generator burbling away up the back of the property and the temp was trying to nudge 40 deg. No pool or water course to cool down in …what a lovely welcome! We could not find the caretaker at this point so we set about positioning the van in under the only shaded area we could find, set camp, and settled back into our chairs under the awning. Celia and I knocked back a few beers whilst we waited for the sun to set and the mercury to drop. No power at this site, very hot, made for a poor nights rest – more like a series of consecutive kips. We set off at 6am the next morning and Aidan in particular was not too happy to rise so early. He is a master late riser. As usual in this part of Aus so late in the season, few roads are maintained now until after the wet season finishes in which case most dirt roads are in poor condition, and then some. The Bungles road indeed was rough with some large ruts and stones and corrugated sections just like it was described to us and we were running our tyres at 28 PSI so we knew it shouldn’t be too bad and drove to the conditions. Good sky early today, our first in weeks for a decent photo. This one is at the Bungles (Purnululu) park entrance sign Approx 30 kms in from our camp and was taken just after 7am. Nevertheless, we pressed on with the 54km 2 hr 4WD road to the park rangers hut which we were required to sign in and make known our appearance in case of emergency or we did not return to sign out. We crossed a few creeks and small bogs along the way, stunning and wild country with only one water crossing which was on the deep side – more about this one and a related funny story further in this post. About 2 hrs into our mornings journey from camp, I suddenly realised I did not swap over empty diesel jerry’s on the D4 for the 2 x full diesel jerry’s we were carrying on the van the night before and only had 126kms of diesel until empty. After quickly doing some sums, Celia worked out from her Hema Map that we only had enough diesel to make it out & back to our camp (where I had two full jerry’s of diesel) to do only 1 of 2 canyon walks we had set out to do that day. Perhaps it was the sleep deprivation but a school boy error on my part and we were lucky we had enough diesel to get us back to camp to at least see one canyon. Looking back from the main Cathedral Canyon entrance. Can you see a 6ft tall person in this image to provide a little perspective of the scale of these walls? We soon arrived at the Cathedral Canyon walk entrance car park which was another 26kms further on from the Bungle Bungle rangers hut. The time was 9am and 33 deg and after bathing in 50+ sunscreen we all set off for the 2 hour round trip to the Catherdral and back. There were loads of other people by this time – many had come in the night before in tour operators special air conditioned 15 & 20 seat 4 & 6WD trucks which are especially designed and used in this remote and rugged area of WA. Don’t ever buy one of these ex-hire vehicles – they are literally driven into the ground. We spent 30 minutes at the Cathedral itself, shared the moment with about 20 others I’d say, nice and cool it was in the cathedral …but we were glad to get back to the D4, crank up the A/C and head back to camp. It was already 37 deg by this time and rising. We made good time back to the rangers hut where we stopped for 5 minutes to get up on the D4 roof to tighten down a few slightly loose roof rack bolts I could here starting to rattle away, and so Celia could also sign us back out of the park. 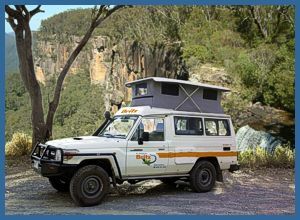 We soon got going again and as I pulled out of the rangers hut area, I noticed a Britz hire Toyota 4WD camper vehicle inching up close behind us. (To the right here is an example of what I’m referring to). After a few kms down the road, the impatient Britz driver decided he wanted to pass me (on a 4WD road that is not meant for vehicles to pass easily) so I pulled over somewhat to let him pass and he tore past at a crazy speed for a road in such poor condition. (As a side note; the road is pretty rough and you see all sorts of 4WD & van parts on the road if you are observant – we saw a complete headlight assembly off one vehicle, numerous plastic 4WD parts, bolts of all descriptions and even a sump case). We did the first 3 creek crossings and when we arrived at the fourth and last, we see these Britz van boys pulled over on the side of the road. So we stop to see if they needed help. One young cool looking dude comes over to us (he sounded eastern european) and says “all good, we are just shooting a few pics of going through the crossing and everything is OK”. I mention that’s good news but they may want to watch their speed a little if they wish to make it back out to the Hwy without breaking stuff on their 4WD, to which he replied; “Thanks man, I get that but we are in a hurry today as we are low on fuel and I (as the designated driver) am covered by insurance if anything broke. And finished his retort by suggesting he prefers to drive at speed anyway”. Awesome I thought – not sure I understood his logic but we kindly bid him farewell with a warm smile and leave him to his photo shoot with his mates. The funniest thing about this story though, unveiled itself a few days later when we were in Broome. Our replacement bulbar lights from Brisbane for the D4 errant Emu incident weeks earlier had finally arrived and I drove to ARB whilst in Broome to have them booked in to be fitted. The ARB sales guy was apologising to me that he could have done our lights later that day if it were not for a Toyota 4WD Britz camper van that just came in off the back of a salvage truck from the Bungles with a collapsed suspension. Ah, could it be the 4WD dudes I thought with a wry smile looking out the front of the store trying to identify if this same vehicle we bumped into 2 days before at the Bungles? I asked a few more questions of the sales guy and as it turned out it did belong to our young European 4WD friends that flew passed us at a rate of knots that day and met soon after at the final creek crossing. What had happened is that they ended up pushing so hard in the Britz 4WD on the final leg out to the Hwy after we saw them, something major on the Toyota’s suspension gave way and they had to get rescued by a recovery vehicle not too far from our van camp. Apparently they were going to travel all night back to Broome that day we saw them ( a further 890 Kms from the Bungles) to catch an international flight back home early the next morning. To my light amusement, they apparently missed their scheduled departure. Bravo boys – job well done and all very funny stuff. Salut’e! The Bungles overall were amazing and we wished it was not so hot and we could have spent another day (and with more diesel) to further explore. The road in / out was manageable and so long as you took your time, had low pressures, everything tightened, little should go wrong with a little luck. I’ve also become ‘lazy’ in my photography on this trip as the hotter it becomes. I don’t like standing in the sun too long these days as I burn almost instantly. I have resorted to taking “quick shots”, not using filters, not changing lenses as much as I normally would – and other stuff like this so my results are quite mixed with a low keep rate. There are the occasional decent one’s though and I hope you find them interesting and gets your imagination going? Hi Meagan – great to hear from you.